A thermometer is a device that measures the temperature of things. The name is made up of two smaller words: 'Thermo' (Greek 'Θερμό') means heat and 'meter' means to measure. You can use a thermometer to tell the temperature outside or inside your house, inside your oven, even the temperature of your body if you're sick. At the start of the seventeenth century there was no way to quantify heat. In Aristotelian matter theory, heat and cold were fundamental qualities. Like dry and wet, heat and cold were qualities combined with "prima materia" to make up the elements, earth, water, air, and fire. Thus earth was dry and cold, fire dry and hot, etc. Although one might speak of "degrees of heat or cold," there was no formal distinction between what we would call the extensive concept of heat and the intensive concept of temperature. Also these degrees were not measured, except perhaps in a very rough way as when a physician put his hand on a patient's forehead and diagnosed "fever heat". "He took a small glass flask, about as large as a small hen's egg, with a neck about two spans long [perhaps 16 inches] and as fine as a wheat straw, and warmed the flask well in his hands, then turned its mouth upside down into the a vessel placed underneath, in which there was a little water. When he took away the heat of his hands from the flask, the water at once began to rise in the neck, and mounted to more than a span above the level of the water in the vessel. The same Sig. Galileo had then made use of this effect in order to construct an instrument for examining the degrees of heat and cold." Over the next several years this thermoscope was developed by Santorio Santorio and Galileo's friend Gianfrancesco Sagredo (both in Venice), Galileo, and others to include a numerical scale. It had thus become a full-fledged air thermometer. The first series of quantitative meteorological observations date from this period. In other parts of Europe the inventor Cornelis Drebbel and Robert Fludd developed similar instruments. The questions about who was the first, and whether one derived his knowledge from another, are sterile ones which shed little light on the historical context in which this and other instruments (e.g., the telescope and barometer) developed. The near simultaneous (and surely independent) invention of the air thermometer illustrates the seventeenth-century trend toward quantification of natural phenomena--an essential dimension of the "mathematization of nature." The liquid in glass thermometer was developed in the 1630s, but a universal standard of temperature remained elusive. Each scientist had his own scale divisions, often based on different reference points. It is impossible for us accurately to convert their measurements to our temperature scale, and at the time it was impossible to compare temperatures in different places. In the early eighteenth century, universal temperature scales based on several fiduciary points (e.g. a mixture of ice and brine, a mixture of ice and water, body temperature, the boiling point of water) were developed by Daniel Gabriel Fahrenheit (1686-1736), Anders Celsius (1701-1744), and René-Antoine Ferchault de Réaumur (1683-1757). Of these, the first two are still in use, and the system of Celsius (extended to become an absolute scale in the nineteenth century) has become the standard scientific temperature scale. The thermometers we use today are different than the ones Galileo may have used. There is usually a bulb at the base of the thermometer with a long glass tube stretching out the top. Early thermometers used water, but because water freezes there was no way to measure temperatures less than the freezing point of water. So, alcohol, which freezes at temperature below the point where water freezes, was used. The red colored or silver line in the middle of the thermometer moves up and down depending on the temperature. Subtract 32 from the Fahrenheit number. Divide the answer by 9. Multiply that answer by 5. Here's an example: Change 95 degrees Fahrenheit to Celsius: 95 minus 32 is 63. Then, 63 divided by 9 is 7. Finally, 7 times 5 is 35 degrees Celsius. Time to go to the beach! Multiply the Celsius temperature by 9. Divide the answer by 5. Here's an example: Change 20 degrees Celsius to Fahrenheit: 20 times 9 is 180. Then 180 divided by 5 is 36. Finally, 36 plus 32 is 68 degrees Fahrenheit. That would be a pretty comfortable outside temperature for taking a walk!! Anders Celsius (1701 - 1744) early became engaged in the general problem of weights and measures, including temperature measurements. Already as a student he assisted the astronomy professor Erik Burman in meteorology observations. At that time there existed a large variety of thermometers with different scales. Perhaps he already at this stage realized the necessity of a common international scale. A temperature scale must be based on one or two standard temperatures, called fixed points. For those it was natural to choose temperatures within the temperature domain of practical interest, i.e. from about plus forty to minus twenty in modern Celsius degrees. Thermometers were simply used in meteorology, in horticulture, and sometimes for indoor use. As fixed points one could use the human body temperature or temperatures of local origin such as the observatory cellar in Paris or the highest temperature in sunshine in London. Of course also the freezing and boiling points of water were used, but it was not self-evident that they really were universal and e.g. independent of the geographic latitude. The position of the degree zero on a temperature scale has created a lot of discussions. The French Réaumur scale had zero at the freezing point but as regards other scales one placed zero outside the ordinary temperature region, thus avoiding the mixture of positive and negative numbers. The zero could be placed at a low temperature, a method used by the Danish astronomer Ole Rømer and then adopted by Fahrenheit. Celsius was accustomed to the Réaumur thermometer, but he also used a thermometer made by the French astronomer Joseph-Nicolas Delisle with zero at the boiling point, thus creating a reversed scale with increasing numbers for decreasing temperatures, but avoiding negative numbers. This reversed scale was not as awkward as we think today and it served its purpose. The change to our modern direct scale was inevitable in the long run, however, but there is no sense in trying to give the credit to any single person. Linné; has often been named as the inventor with reference to his famous work "Hortus Cliffortianus" of 1737, five years before Celsius' publication. However, in studying Linné's work it is obvious that the few temperatures he mentiones are impossible as modern Celsius' degrees. Linné met Fahrenheit in Holland and it is clear that he used Fahrenheit temperatures when he returned home to Sweden. Most probably Linné abandoned the Fahrenheit scale when he learned about Celsius' research. After the death of Celsius in 1744 thermometers with a direct scale appeared in the meteorology reports under different names, such as 'Celsius Novum', 'Ekström' and 'Strömer'. Linné had a great interest in thermometers, and he ordered a thermometer with the modern scale from the instrument maker Daniel Ekström around 1744. The scale is mentioned in a dissertation by Samuel Naucler in 1745, but this does not indicate Linné as the single inventor of the modern scale. Certainly the change of scale became obvious to the Uppsala scientists in general. In an account of the history of the thermometer in the Proceedings of the Royal Swedish Academy of Sciences 1749, Pehr Wargentin, Secretary of the Academy of Sciences, mentiones Celsius, his successor Strömer and the instrument maker Ekström in connection with the direct scale. Linné is not mentioned at all. No single person can be given the credit. From the scientific point of view the most important contribution to the modern temperature scale is due to Celsius because of his careful experiments on the fixed points. The direction of the scale comes in second place, and was hardly a great intellectual achievement. The Fahrenheit scale, which measures temperature, was created by Daniel Gabriel Fahrenheit (1686-1736), a German-Dutch scientist, in 1724. Fahrenheit, who devoted much of his life’s work to the measurement of temperature, also invented the alcohol and mercury thermometers. On the Fahrenheit scale, the point at which frozen water melts is 32°, and the point where at which it boils is 212°. Between these two points is exactly 180°, a number easily divisible on a thermostat. Although we know with a degree of certainty what measurements Fahrenheit used to determine his scale, his process of arriving at the final scale is largely unknown. Several stories have circulated regarding how Fahrenheit devised his scale. One is that he established 0° as the coldest temperature he could measure outdoors during the winter of 1708 to 1709 in Danzig, Germany. This measurement and Fahrenheit's own body temperature, which he measured at 100°, were the two marks on which he based the rest of his scale. Many think that either his thermometer was off or he was running a fever that day, resulting in the relatively high reading on the bodily temperature. The scale was then divided into 12 separate segments, which were later divided into eight, creating a scale of 96 separate degrees. In another story, Fahrenheit figured 0° by taking a measurement of the point at which equal parts of salt and ice mixed together melt. He then established 96° as the blood’s temperature. Yet another story holds that Fahrenheit co-opted Ole Rømer’s scale of temperature. With this scale, 7.5° is the freezing point of water. Fahrenheit multiplied this number to get rid of the fractions, and then refigured 32° as water’s freezing point, with 64 degrees separating the body’s temperature at 96°. 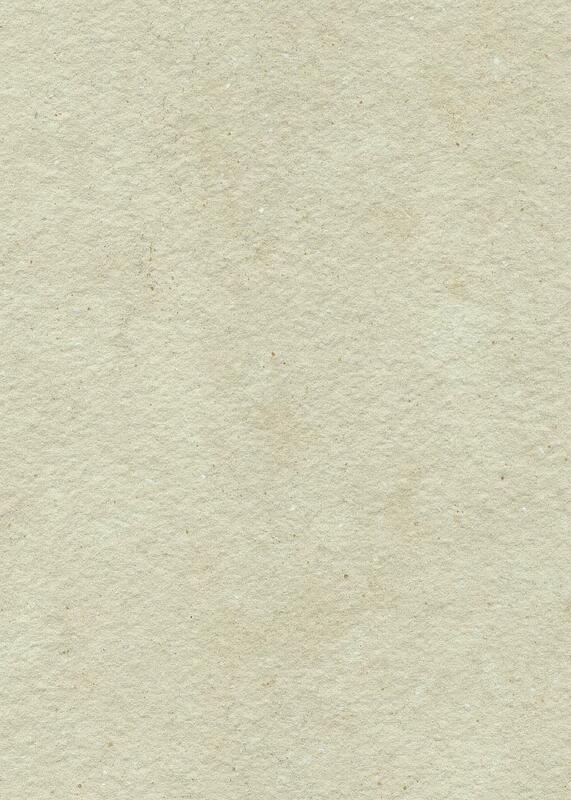 He then marked degrees using six lines. Some believe that Fahrenheit was a Freemason, and because there are 32 degrees of enlightenment, he chose to use 32 as the melting temperature of water. Degrees are also used as levels with the Freemasons, hence the use of the word on the scale. However, there is no documented evidence that Fahrenheit was a Freemason. In yet another story, it is said that Fahrenheit believed that a person would freeze to death at 0° and would die of heat stroke at 100°. This created a scale of 0° to 100° that encompassed the range of livable temperatures. Another story states that Fahrenheit recorded the melting point of water, the boiling point and a human’s body temperature, and then put the melting and boiling points exactly 180 degrees apart. One far fetched story says that Fahrenheit observed the melting point of butter as 100° and set it accordingly. Because Fahrenheit degrees are 5/9 of a Celsius degree, it is easier to make more exact measurements without using fractions in the Fahrenheit scale. Fahrenheit continues to be used in the United States, although most other countries that use the metric system changed to Celsius in the 1960s and 1970s. The Kelvin temperature scale (K) was developed by British William Thomson, 1st Baron Kelvin (1824–1907) in the mid 1800s. The zero point on this scale is base on the point at which the pressure of all dilute gases mathematically project to zero from the triple point of water. Recall that the triple point is the temperature at which liquid water, ice, and water vapor can coexist simultaneously. The zero point of this scale is equivalent to -273.16 °C on the Celsius scale. This zero point is considered the lowest possible temperature of anything in the universe. Therefore, the Kelvin scale is also known as the "absolute temperature scale". At the freezing point of water, the temperature of the Kelvin scale reads 273 K. At the boiling point of water, it reads 373 K.
Lord Kelvin developed this scale with the help of a Carnot engine. The Carnot engine deals with the relationship between pressure, work, and temperature. The Carnot engine is the most efficient engine possible. However, even it cannot reach 100% efficiency. If an engine was 100% efficient, no energy would be wasted. The Carnot engine is only theoretical, which means that all real engines are even less efficient. The operating principle of a thermometer is quite simple. A known measure of liquid (mercury, alcohol, or a hydrocarbon-based fluid) is vacuum-sealed in a glass tube. The liquid expands or contracts when air is heated or cooled. As the liquid level changes, a corresponding temperature scale can be read to indicate the current temperature. 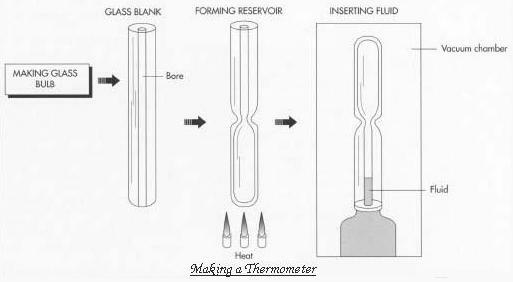 Thermometer manufacturers start with glass blanks with bores down the middle; these are usually received from glass manufacturers. The bulb reservoir is formed by heating one end of the glass tube and pinching it closed. The bulb is sealed at its bottom, leaving an open tube at the top. Next, with the open end down in a vacuum chamber, air is evacuated from the glass tube, and the hydrocarbon fluid is introduced into the vacuum until it penetrates the tube about 1 inch. Due to environmental concerns, contemporary thermometers are manufactured less with mercury and more with a spirit-filled hydrocarbon liquid. Thermometers are designed according to predefined standards identified by the National Institute of Standards and Technology (NIST, formerly the National Bureau of Standards) and standard manufacturing practices. Within the regulatory guidelines there are provisions for the custom manufacture of thermometers. Custom thermometers can be as varied as those who use them. Different sizes exist for the amount, weight, and length of glass used, the type of liquid filled into the glass, the frequency of gradations laid onto the glass tube or enclosure, and even the color of the gradation scale marks. A design engineer will look at the travel limits for the liquid to be used in the thermometer. Once precise limits are established, the dimensions of the glass tube and size of the glass bulb can be determined. Use of electronic components in thermometers has grown. Many of today's broadly used thermometers contain digital readouts and sample program cycles to feed back the current temperature to a light-emitting diode (LED) or liquid crystal display (LCD) panel. For all the electronic wizardry available, a thermometer must still contain a heat-cold sensitizing element in order to respond to environmental changes. Thermometers consist of three basic elements: spirit-filled liquid, which responds to changes in heat and cold; a glass tube to house the temperature-measuring liquid; and black ink to color in the engraved scale marks with legible numbers. In addition, other elements are necessary for the manufacture of thermometers, including a wax solution used to engrave the scale marks on the glass tube; an engraving engine that makes permanent gradations on the glass tube; and a hydrofluoric acid solution into which the glass tube is dipped to seal the engraving marks. The glass material forming the body of the thermometer is usually received from an outside manufacturer. Some thermometer products are made with an enclosure, which can be made of plastic or composites and may contain scale gradations as opposed to having these on the glass tube itself. The enclosure also serves to protect and mount the thermometer on a wall, post, or in a weather shelter box. 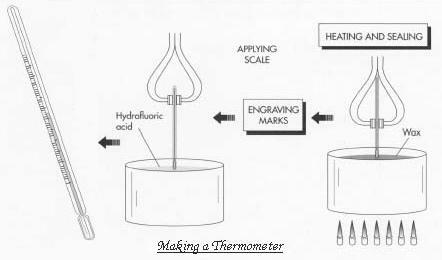 Although there are numerous types of thermometers, the production process for the most common of these—the classic household variety—is described below. 1. First, the raw glass material is received from an outside manufacturer. 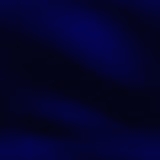 The tube is made with a fine passage, or bore, throughout its length. The bored tubes are checked for quality; any rejected parts are sent back to the manufacturer for replacement. 2. The bulb reservoir is formed by heating one end of the glass tube, pinching it closed, and using glassblowing and the application of an air-driven torch to complete it. Alternately, the bulb can be made by blowing a separate piece of lab material that is then joined with one end of the glass tube. The bulb is sealed at its bottom, leaving an open tube at the top. 3. With the open end down in a vacuum chamber, air is then evacuated from the glass tube, and the hydrocarbon fluid is introduced into the vacuum until it penetrates the tube about 1 inch (2.54 centimeters). Due to environmental concerns, contemporary thermometers are manufactured less with mercury and more with a spirit-filled hydrocarbon liquid. Such a practice is mandated (with tolerance for a limited use of mercury) by the Environmental Protection Agency (EPA). The vacuum is then gradually reduced, forcing the fluid down near the top of the tube. The process is the same when mercury is used, except heat is also applied in the vacuum chamber. 4. Once full, the tube is placed upon its bulb end. A heating-out process is then conducted by placing the thermometer into a warm bath and raising the temperature to 400 degrees Fahrenheit (204 degrees Celsius). Next, the temperature is reduced to room temperature to bring the residual liquid back to a known level. The open end of the thermometer is then sealed by placing it over a flame. 5. After the tube is sealed, a scale is applied based on the level at which the fluid rests when inserted into a water bath of 212 degrees Fahrenheit (100 degrees Celsius) versus one at 32 degrees Fahrenheit (0 degrees Celsius). These reference points for the desired scale are marked on the glass tube before engraving or silkscreening is done to fill gradations. 6. The range lengths vary according to the design used. A scale is picked that best corresponds to even marks between the reference points. For accuracy purposes, engraving is the preferred method of marking. The marks are made by an engraving engine after the thermometer is placed in wax. The numbers are scratched onto the glass and, once complete, the thermometer is dipped in hydrofluoric acid to seal the engraved markings. Ink is then rubbed into the marks to highlight the scale values. When enclosures are used on the scales, a silkscreening process is used to apply the marks. 7. Finally, the thermometers are packaged accordingly and shipped to customers. The manufacturing process is controlled by widely adopted industry standards and specific in-house measures. Manufacturing design considerations include quality control checks throughout the production process. The equipment used to perform fabrication tasks must also be carefully maintained, especially with updated design protocol. Waste materials accrued during manufacturing are disposed of according to environmental regulatory standards. During the manufacturing cycle, equipment used to heat, evacuate, and engrave the thermometer must be checked and calibrated regularly. Tolerance tests are also performed, using a known standard, to detennine the accuracy of the temperature readings. All thermometers have a tolerance for accuracy. For the common household, this tolerance is usually plus or minus 2 degrees Fahrenheit (16 degrees Celsius). For laboratory work, plus or minus 1 degree is generally acceptable. Although the longstanding simple glass thermometer is unlikely to change, other thermometer. After the bulb reservoir is formed and the liquid inserted, the unit is heated and sealed. Next, the scale markings are added. This is done using engraving, in which the bulb is dipped in wax, the marks engraved, and the bulb dipped in hydrofluoric acid to seal the marks on the glass. forms continue to evolve. With technological advances and the more widespread use of lighter and stronger materials, manufacturers of electronically integrated temperature instruments can provide more accurate measurements of temperature with minimal equipment bulk and at an affordable price. Analog box thermometers, for example, were once used with a long wire and probe tip for in-ground temperature measurements, among other uses. Today, the probe tips are made of lighter materials, and the boxes, loaded with digital electronics, are not as bulky and square. Looking ahead, further work with the microchip may provide the impetus to fully digitize the temperature measuring process. Also, it may eventually be possible to direct an infrared beam into soil and extract a temperature reading from a target depth without even touching the soil.